Fascia & Guttering are available in an extensive range of options, and cater for a variety of projects. Our guttering is sourced from well-established brands including Brett Martin and Lindab. Fascia board and gutter pipework may be among the final features that you install when carrying out renovations on your home. In a new build project they are important both for maintaining your home in good condition, and for achieving the look and finish that you want. Fascia installed around the edges of your roofing provides a seal across the gaps between the wooden rafters. These form part of the structure of your roof. These fascia boards perform an essential function to help protect those rafters, and the space beneath your roof. The fascia prevents water, dirt, pests, and vermin entering that space. The fascia also provides cladding over the edge of the roof space, helping to add insulation for that space reducing your home heating costs. Correctly fitted fascia is also important to provide ventilation for your roof space. Ensure there's a gap for an air vent above the fascia boards, or fit a fascia soffit board below the fascia facing boards. This ventilation is essential to prevent the build up of condensation in your roof space. This can cause mould and bacteria to build up and risk rot in the roof structures. So correctly fitted fascia around the edge of your roofing helps maintain your roof in good condition. It reduces maintenance and repair costs, and makes your home a healthier environment to live in. In addition to this functional role played by fascia boarding, a neat, well installed fascia can help to give your home a great look. 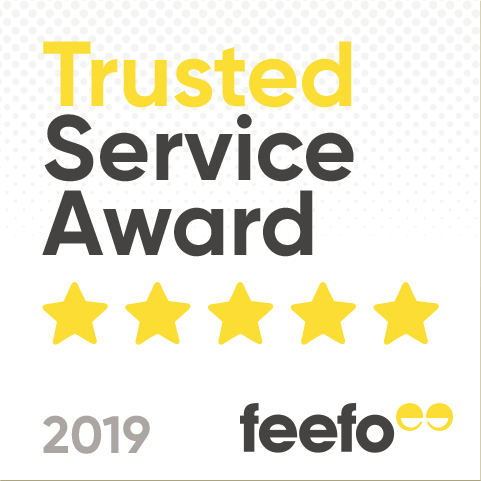 Choosing the right fascia boarding to complement the style of your roofing can provide your home with a tidy, attractive look. These are all from the Ariel plastics brand, specialists in fascia manufacture. You can also find silicone fascia waterproofer for your fascia. This helps ensure your fascia boards provide a seamless, weather proof barrier to protect your roof space and rafters. We offer all of the gutter products and accessories that you might need to install a complete gutter system on your home. Our range includes all kinds of gutter pipework, as well as the fixings and brackets you will need to secure the gutter system in place. All are available in a choice of material from trusted manufacturers who specialise in making gutter work products. These include cast iron gutter products from Hargreaves Foundry and steel gutter products from Lindab. We also offer gutter products in copper from both Lindab and Coppa Gutta. 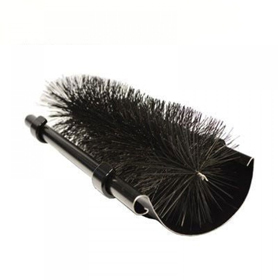 You will also find a selection of gutter brushes to help clear your gutter if it becomes blocked with foliage or soil. This helps maintain your gutter work in good condition to function and look its best. Like the fascia boarding, your gutter system performs an essential function on your home. It helps precipitation drain correctly and in turn protects your home from weathering and water damage. So your gutter helps to keep your home in good condition and reduce the need for maintenance and repair. Choosing the right gutter can also give your home a stylish and attractive finish. When coordinated with your roofing, stonework, and fascia it can help you to achieve the look that you are after. 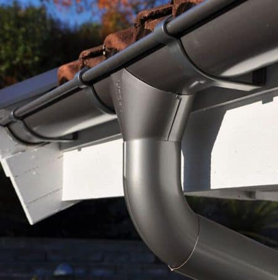 Our gutter range focuses on metal gutter work, in a choice of steel, copper, or cast iron. These different types of metal gutter offer different qualities. Which material you choose will depend on the particular gutter and drainage needs of your home, and the look you want to achieve. Metal gutter work offers greater strength and durability compared with gutter work made from plastic. As might be expected the initial purchase costs of of metal gutter can be higher than for a plastic gutter. The installation costs can be higher as well if gutter installation professionals are needed. However, given the greater durability of metal gutter work these higher initial costs can be balanced out by lower repair costs. In some cases it can be more cost efficient to choose a metal gutter when considered over the life time of the gutter, compared with a plastic gutter. Metal gutter pipework will also typically be deeper than plastic gutter pipework. It's preferable in areas of high precipitation where your gutters will need to cope with higher precipitation volumes. Steel gutter work will typically be the least expensive type of metal gutter compared with copper or cast iron. It also offers greater choice in terms of the finish and look of the gutter, and is available in a range of colours and finishes. Copper gutter pipework will tend to be more expensive initially than steel or plastic gutter work. However it is extremely durable due to its resistance to corrosion so brings extremely low maintenance costs. It is also very long lasting and can be expected to last for at least 50 years. Copper gutters offers a distinctive look that can make your home stand out. It also complements your stone work, roofing, and fascia boarding. This is highly sought after and can help to increase the value of your home. Similar to copper, choosing a cast iron gutter will be more expensive to purchase and install than a steel or plastic gutter. However cast iron is similarly extremely durable and has low maintenance costs, and has been known to last for as long as 100 years in some cases. So it can be more economical over the life time of your home and gutter. A cast iron gutter is incredibly strong and will withstand buffeting by strong weather . Cast iron provides a desirable, traditional, Victorian look for your gutter. It may be required by local conservation regulations in certain areas to ensure that it fits in with the appearance of other buildings. Here at BSO, we are able to provide durable and long-lasting systems. All products offer the highest quality. They are suitable for a high standard finish to any project. 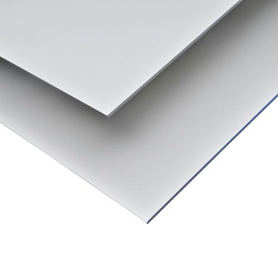 PVC Fascia & Soffit Boards are a crucial element for protecting properties against damage. Their appearance is also of importance. The products that we offer are an attractive, maintenance free and cost-effective solution. The decorative finals we have to offer, include uPVC Fascia , Fascia Corners, End Caps, Joiners. All of which are available in a variety of colours and sizes. Plastic Guttering is a firm favourite, due to being cost-effective and reliable, it is also simple to install. Plastic guttering offers versatility, and is suitable for domestic and commercial applications. Our comprehensive range showcases products from industry leading brands, Brett Martin. The products consist of profile styles including Half-Round, Round, Square and Ogee. Lindab are a well-established and dependable brand, due to their great quality and notorious durability. Lindab offer an extensive range of products, in an array of colours and styles. Guttering should be cleaned at least two times each year. In the event the gutters on your house do not work properly it may result in gutter overflow causing substantial water damages. Installing cast iron gutter in your home means you don't need to be worried about approximately 100 decades. Repairing the gutters is a really big investment decision that may help protect your entire family. You can select from a broad selection of colors if you put. If you're looking to set up gutter on your home roof, among the options is that of a gutter. It is essential to keep the gutters free of leaves at least at one time each year. Gutters arrive in a lot of types styles and materials. Stainless-steel gutters are robust and don't rust, but they are very costly. Victorian ogee gutter has been used for many decades. Gutters are made from metal or vinyl but can be found in a host of unique materials. Your rain gutter manage a good deal of water that is plain. They are a terrific example of a component you ought to pay a great deal of attention to. An excellent rain gutter will prevent from disappearing soil you've got around your house. Gutters are found in many types and shapes. Be sure your gutters are painted by you. Constructing a gutter whilst bearing in mind the kind of gutter protector to put in ahead will lead to receiving. On your own you can't clean the gutters at case, for doing the job, you may need to employ professionals. When you're installing gutters, among the choices could be gutters. The gutters are for the most part favored in the region where the rainfall motive is more. They may be one of the additions to your home as long as they're installed. Gutters are located in various materials. Draw a map of your house and where you desire the gutters to be determine which length each section needs to be and also what components you will want. What material you select to your gutters is valuable to the sturdiness of your rain gutters and the effect. Guttering is something that's critical for each home. Seamless gutters are created from an range of materials that may vary from aluminum, steel which has been galvanized and aluminum. They may be highly advantageous for a number of factors. Eloquent gutter are in fact created by a company with gear. Since gutters arrive in materials, and various sizes one of those things you will want to understand is what size you want. Should you wish to have rain gutters' strongest kind then you may wish to put money. Rain gutters and downspouts are in just about any home. They're the cast iron gutters, when there's something it is possible to trust if it regards gutters. Hence the gutters ought to be well ready to take care of the seasons. They should be aligned with the sheets. For an ordinary homeowner, cleaning the gutter of the home can turn into a huge matter. Standard house gutters aren't large enough to deal with the rainwater leak that is larger. Thus another sort of gutter system to the 110mm has to be fitted. Until the rains start in your region you will wish to wash your gutters. Actually, you aren't confined by the gutter. Installing gutters isn't a DIY undertaking that is tricky. Now vinyl gutters are getting more popular. Gutter play a critical function in fighting water damage and homeowner should know about their own situation. Moreover, gutters made from metal are tough to paint. Steel gutter are fitted for a number of years they getting more widespread in the uk across Europe. Gutters or guttering are among the very crucial areas of any building. It's an important functional substance in the roofing of the house. The very first reason is they can produce the house seem more beautiful. The box gutters that are made from cast aluminium gives a sturdy holding speaks volumes about its impeccable quality.